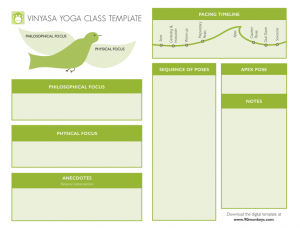 Discover a foolproof way to successfully plan your yoga classes! The Class Planning Template is one of the tools provided in our 200-Hour Teacher Training & Innovative Teaching Methodology 500-Hour Advanced Training Modules to bring an intellectual approach to your class planning. After developing a minimum of 20 classes with these templates, you can integrate them into your teaching repertoire and never feel unprepared for class again! The Class Planning Template includes a PDF download you can instantly print (please respect copyright) with an instruction sheet to help guide your template creation process.